UNITED NATIONS, March 10. /TASS/. Moscow fully complies with the sanctions, imposed by the UN Security Council on North Korea, Russia’s UN embassy said in a letter, published by the organization Friday. "The Russian Federation is fully implementing the provisions of the Security Council’s sanctions regime against the Democratic People’s Republic of Korea, including the obligations stemming from resolution 2321 (2016)," the letter reads. "A draft decree of the President of the Russian Federation on the implementation of the resolution, drawn up by the Ministry of Foreign Affairs of the Russian Federation, is currently before the relevant ministries and departments of the Russian Federation for review," the document says. According to the Russian mission to the UN, on November 30, the day when the resolution was adopted, "the Ministry of Foreign Affairs of the Russian Federation also informed the executive bodies that the provisions of the resolution are applicable in the country’s territory pending the issuance of the decree of the President of the Russian Federation." North Korea is currently under the strictest set of international sanctions, intended to prevent Pyongyang from developing nuclear weapons and delivery vehicles. However, UN Security Council expert note in each of their reports that the country’s authorities manage to bypass the restrictions, which include economic sanctions, a weapons embargo, ban on supplies of dual-purpose equipment and materials, as well as luxury objects. 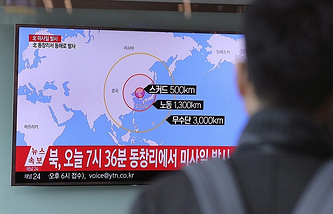 The situation on the Korean Peninsula aggravated in recent days, following rockets tests by North Korea. Earlier this week, the UN Security Council adopted a statement condemning Pyongyang’s actions and demanded that the country abstained from provocations, threatening to impose even harsher sanctions.